As you are reading this I am Miami bound! Looking forward to sticking my toes in the sand and eating at a few amazing restaurants. That's how hubby and I did our honeymoon 20 years ago, we rolled from restaurant to restaurant and tried to find stuff to do while we were waiting to get hungry again, LOL! All orders placed through Friday afternoon have been shipped. 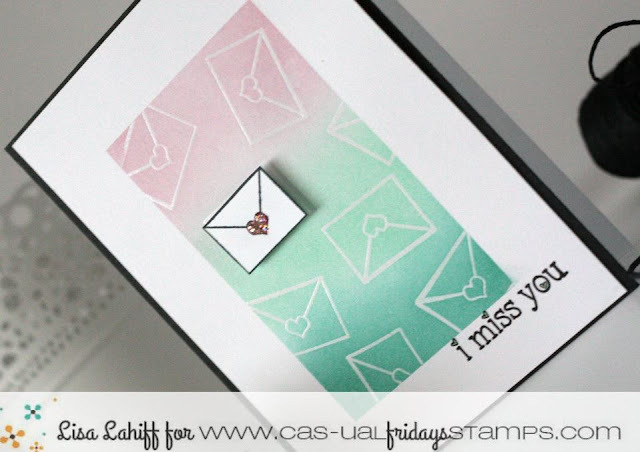 She got inky with her distress inks and Special Delivery to create this! I used the Special Delivery Stamp set to stamp and emboss with in a masked area. Leaving the mask in place I went over the embossed area with distress inks. Finally, I stamped one envelope onto white cardstock, colored in the heart and added stickles. This was fussy cut and added to my background with foam adhesive. The sentiment was stamped in the lower right corner before the panel was adhered to a black panel. Love your card. Simplicity is the best for me. And I love my Distress Ink.